Official Massachusetts (MA) notary public seal and stamp. Meets state of Massachusetts guidelines for notaries to use ink stamp or embossing seal. Customize with notary professional name, location, and commission expire date. Standard size is 1.625". 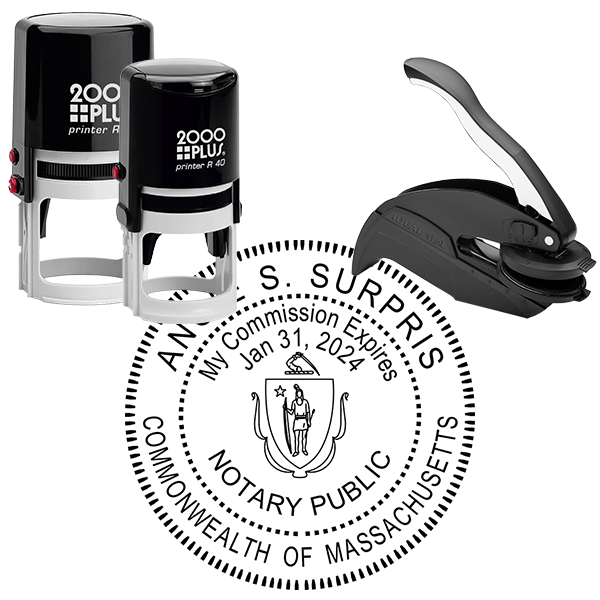 Massachusetts Notary Seal Stamp Details Fantastic for any notary public, our Massachusetts Notary Seal Stamp is the most wonderful companion for almost any home office big or little! Produced of high quality parts, our Notary Seal Stamp will help you get your to-do list dealt with in no time! Simple to use, and available in a wide range of types, every one of our merchandise are examined for quality prior to being shipped out of our production center. Concerned about staying updated with the most recent in notary design laws in your state? Don’t worry! We make sure that every one of our notary seal stamps are compliant with local law and guidelines. By doing this, you can rest assured knowing that your notary stamp is 100% official! Buy your brand-new Massachusetts Notary Seal Stamp here!